A visitor is thinking about training her Yorkie to show, but she's not sure how to go about teaching her dog to walk on a show lead. The Dog Expert offers some tips to help get this little Terrier ready to sparkle in the dog show ring. 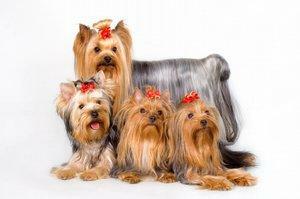 I am trying to work up the courage to show my Yorkshire Terrier. The only thing I think I will have trouble training her to do is walk out on a show leash. How do you get them to "walk the walk" of a show dog? I love it when people ask questions about showing dogs! You can train almost any dog to walk on a lead, but not every dog has that show dog sparkle. That is something most dogs are either born with or they aren't. I recommend you find a dog club or training facility in your area and begin attending classes. You can work with your dog on lead and see how she responds to everything going on around her. Most Terriers have great attitude in the ring, and they really perk up around other dogs. This typically translates to a very energetic walk when they get in the ring, and most will tend to lead out a bit. This is great because judges love to see a confident dog. You can also get your dog to perk up a bit with the use of a small squeakie toy. Just squeak it a few times as you go around the ring, but don't overdo it or you might distract the other dogs. Your own confidence level will also travel down the lead to your dog, so the practice will be good for you too. With this in mind, I think you'll find our article How to Show Dogs in the Ring helpful. Thanks for your question, and best of luck!